Fuel marketers and other private business owners under the aegis of Committee of Directors, Ibru Port Complex, at the weekend, flagged off the palliative repairs from Sunrise to Coconut section of the Apapa-Oshodi Expressway, after waiting endlessly for the intervention of the federal government and the Lagos State government. These stakeholders have also raised the alarm that the Apapa bridges are in near collapse as they were not designed for trailers and tankers laden with cargo or petroleum products parking for days. This is coming as 10 lives were said to have been lost in Sunrise-Coconut section of the Apapa-Oshodi Road between October and November 2017. Speaking during the flag off ceremony at the weekend, the Chairman of Committee of Directors, Ibru Port Complex, Olorogun Oskar Ibru called on the federal government and the Lagos State government to pay serious attention to the roads leading to Nigeria’s premier ports – Apapa and Tin Can Island Ports. He said the flag off of the repairs would also alleviate the sufferings of their customers, commuters and members of the public from what he described as the horrendous unbearable congestion that has led to loss of lives and properties. “Apapa residents and its environments have been on the receiving end of the continuous degradation of roads without timely intervention of maintenance. The bridges in particular are near collapse as they are not designed for trailers and tankers laden with cargo or products remaining stationary for days. The drivers and their motor boys use any available drains or space on these roads of bridges as toilets and places to wash and dump refuse. The nuisance value and its effects on the residents and commuters are obviously severe,” Ibru explained. Ibru said the initiative was part of the Corporate Social Responsibility (CSR) of the organisations to assist the government in order to prevent the road from total collapse. Also speaking at the flag off ceremony, the Area Comptroller of the Kirikiri Lighter Terminal of Nigeria Customs Service (NCS), Mrs. Lami Wushishi said the revenue of the agency had dropped as a result of the traffic congestion caused by the bad road leading to Apapa. “The bad road has affected businesses, especially we, Customs. It has affected our revenue. It has affected trucks coming to do business with us- the volume has really come down. We have tried our best to see how to make it possible- we exploit the use of barges for them to bring cargoes but it has not been easy for us,” Wushishi explained. She commended the stakeholders for committing their private resources to make the road better. Also speaking, the President of Association of Maritime Truck Owners (AMATO), Chief Remi Ogungbemi called on the National Assembly to enact a legislation that would empower the Nigerian Ports Authority (NPA) to utilise a certain percentage of their revenues to repair Apapa roads. 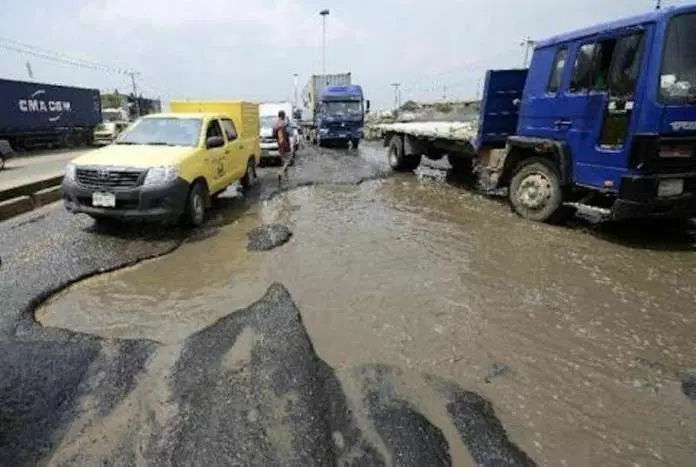 Ogungbemi said he had attributed the poor state of Apapa roads in the past to status of Lagos State as an opposition party, stressing that he was shocked that Apapa roads had collapsed even when Lagos State is also being controlled by the party at the centre.